How to cope with the summer heat on a Disney trip! If you're going to Florida and Walt Disney World, it's bound to be hot. Even in February, 30 degrees is possible. In Paris the heat isn't such a big issue, as it's only in the Summer season that it gets this warm, but even so if you're there on a extra hot day, it can still be unbearable. 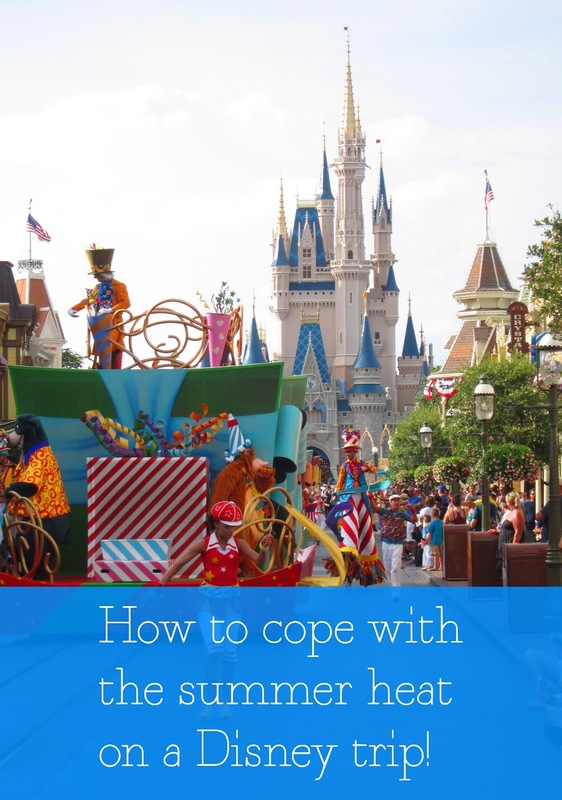 It's important that you don't let the heat ruin your time at Disney, so I thought I'd share a few coping mechanisms that I've learnt on previous Disney trips on my blog today. Get into the park for opening and stay till late morning, then go back again in the early evening. This is how we spend our days when we're in Florida. There won't be so many people in the park at those times and you won't be walking around the park in the hottest part of the day. With Paris, we usually stay in the parks all day though as our trips are shorter. As someone who is prone to heatstroke and headaches during hot weather, I can't stress enough how important it is to drink lots of water. You end up walking miles on a day at Disney, so it's important you stay hydrated. The last thing you want is to be peeling and uncomfortable whilst you're waiting in queues or sitting watching shows. Go on the outside rides before 11 and after 3, so that you avoid the powerful, late morning and early afternoon sun. Attractions like Dumbo and the Flying Carpets are so nice in the early morning and evening! If you chose to stay at the parks around lunchtime, this is the perfect time to watch shows or queue for indoor rides like Buzz. You'll be much cooler with aircon inside, than being under the direct sun on outdoor rides. If you're going to watch the afternoon parades and it's still hot, try and reserve a spot that has a bit of shade. It might mean you have to wait around longer, but at least you won't be quite as exposed to the sun when the parade comes around. How do you cope with the heat whilst you're at Disney?